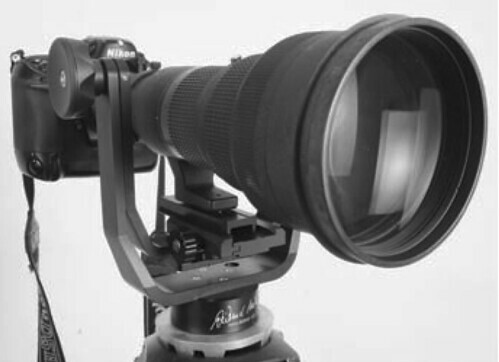 A Gimbal for a 400 5.6 is an overkill unless you are a birds in flight photographer. I used to use a Manfrotto 486 RC2 for birds on a perch. It worked fairly well but not for BIF. I moved on to Arcatech GV2 but soon realised that I don't really need a tripod for using my 400 unless the shutter speed is below 1/100. That's the irony of life. I am not too sure if the GV2 can quite be a replacement for a proper Gimbal. I would agree with the others not to buy $100 gimbals off ebay. The Manfrotto gimbal is a little too heavy for me. I think that will fit your needs very nicely - enjoy! I was looking for a head that would be good for birds in flight. The Manfrotto looked like a good option. It looks like it works exactly the same as any other gimbal head (though with two sides to it as opposed to one side). Could you please explain how it would work any differently? 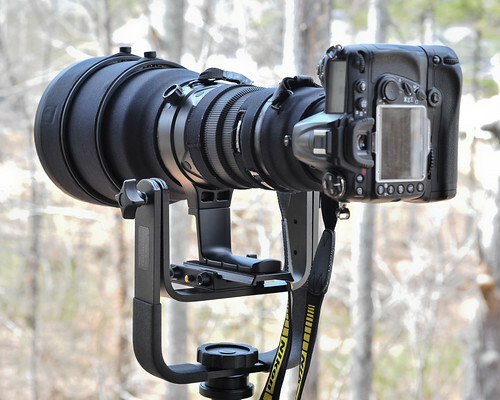 It doesn't pan, but you'd probably be happier with a monopod for birds, anyhow (which is what it's made for). For the 400 f/5.6, the Manfrotto 234RC2 or the RRS MH-01 would be ample, depending on whether you're an RC-2 or A/S QR plate user. What is really bad as I have a modified 234 on my monopod so I should have recognized the number. This or handheld is what I do now. And no, I would never put that on a tripod (I realize that no panning on a tripod could happen with this head). I thought (incorrectly) I was referring to the Manfrotto 393. I just wondered if at times I would be happier with a gimbal head on a tripod! The Manfrotto 393 looks like a good (and not super expensive option) to try. How does the Manfrotto 393 head differ from a proper gimbal? Well, a proper gimbal head allows vertical and horizontal adjustments so that the up/down pivot axis passes through the centre of gravity (CoG) of the camera/lens combination. That means you can loosen the friction and tilt the lens to any angle - and it will stay there. This is why a gimbal is great for shooting flying things, it's easy to track such things with the lightest of touches. If the pivot axis is below the CoG then tilting the lens will make it want to droop. So you need to increase the friction. The greater the angle of tilt, the greater the amount of friction needed to stop it drooping. If the pivot axis is above the CoG then tilting the lens will make it want to swing back down to the horizontal, again requiring more and more friction to keep it in place at steeper angles. With the 393 there is no horizontal adjustment possible - so it's all a matter of luck as to the positioning of your pivot axis. Here's an example where the pivot axis is below the CoG. And one where it's above the CoG. FWIW, I ordered the Manfrotto 393 head for use with my 100-400 with the hopes of eventually getting a larger prime. When it arrived I was amazed at the size and weight, the pics didn't do it justice in that regard. That said, it was more than I needed (or wanted to carry) at that time, so I returned it and continued hand holding or using the monopod with a ball head. When I finally bought the 300/2.8 IS, I took a gamble with the Opteka I mentioned earlier and am very satisfied. That Jobu looks perfect tho, I'm sure you'll love it. Thanks Frank, but I figured all that out, you missed my response directly above your reply. I misunderstood which head was being talked about. Hi Tanglefoot47, you can adjust the height of the L-bracket with two screws that mount it to the upper pinion. With my 7D I had to reverse mount the Wimberley plate because the balance point was a few inches behind the tripod foot. Here's a link to Wimberley's balancing instructions, very similar to the Jobu. But with the Jobu you only have three vertical height settings, I usually set the height were the center of the lens is even with or just above the tilt axis. You can set it one notch higher if you need more clearance for steeper angles, but this can make your balance a little top heavy.